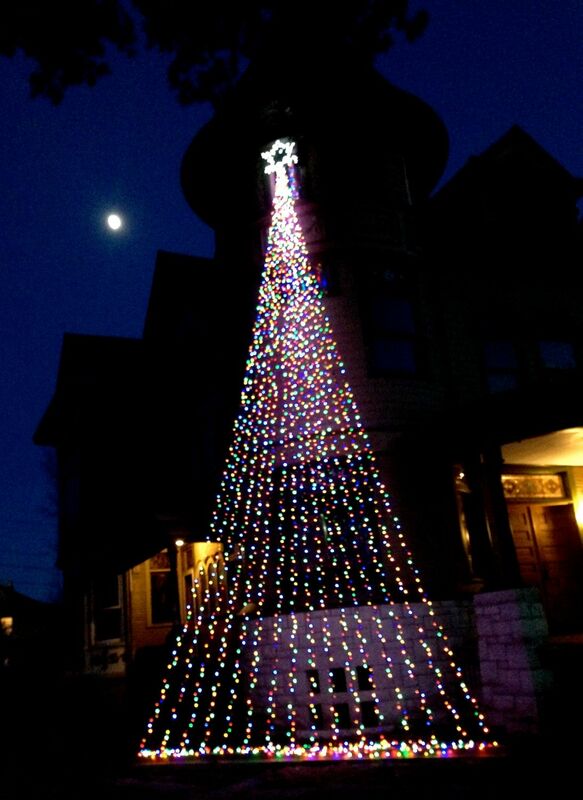 For the holiday season I created a three-story Christmas “tree” at the Cross House. I wanted to do something for my first holiday season in the Cross House. But what? The house is so huge and the possibilities are endless. Obviously, I was not going to erect scaffolding to string lights all over the house. No. But nor did I want to do something, well, small. So, no lighting up just the easily accessed porches. Then an idea hit me: I should take advantage of the main glory of the exterior, the three-story tower. But how? 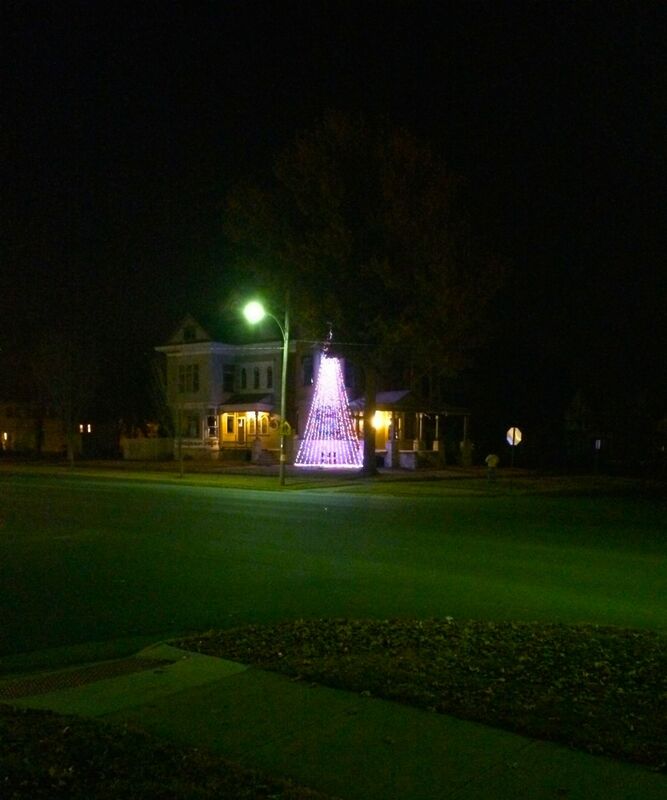 The weeks passed and one idea just kept coming back around: A big, really big light tree. It was easy actually, and Justin helped me. We opened up the center, third-floor window, and screwed a big hook above the window. Then I purchased 600 linear feet of LED lights. We simply dropped each string to the ground, and through a hook in a 16-foot wide bottom board secured to the ground, and then pulled another string back up, and so on. Justin then surprised me with a white star for the top! The whole process was easy and kinda fun. During the day the tree is, unexpectedly, almost invisible. But at night? Oh baby. I just stood out front and smiled and smiled and smiled. From the first night I began receiving positive tweets from neighbors and other Emporians. I am crossing my fingers that the tree is large enough so that Santa will see it from the North Pole. And access for Santa should be easy. After I posted this thread, I had requests to add an image from across the street. One of my neighbors already had sent me just such an image, so I have attached it below. Although the whole top part of the tree is obscured by a branch, you still get the idea. Thanks Lesley! 8 Responses to Can Santa see the Cross House from the North Pole? If you don’t get a picture of this from across the street so we can all see how awesome it is, I might stop being your best friend. Also, Christmas is my favorite. I was coming to request the same thing! 🙂 Beautiful though! Outstanding! I love it. It’s really a great idea – simple but full of impact! Is this still lit? I have been reading your blog all afternoon and just got to this post! Love your blog and so hope to tour this house some day!! The tree is still up, and lighted. But not for long! AWESOME! Just awesome! I am also a believer in the absolute necessity of Christmas lights. I think Santa did see your lights, Ross.